For the second year in a row, Father Mike Moynahan gave a unique homily. The priest gathered all of the kids at the front to serve as his counselors to help him tell the story of the birth of Christ. After Mass, we raced back home. 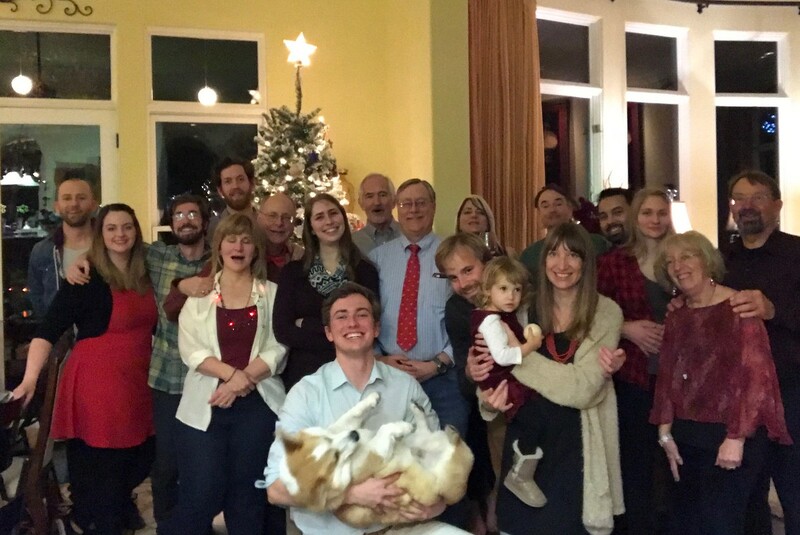 The Christmas Eve group this year was 19, including Sharon's brother Tom, Eric, Eric's girlfriend Ashley, Kevin, Leah, Lydia, Sharon's brother Tim, Kathy, Erin, Erin's boyfriend Cromac, Eileen, Eileen's boyfriend Will, Leah's parents Steve and Teri, Jim Dunn, Jack, Drew, Sharon and I. This ties the record for the number of people that we have hosted for a holiday dinner with Thanksgiving of 2014. Sharon made a nice dinner of Osso Boco, risotto and green beans. I really enjoyed having a chance to sit with Drew and Jack at one end of the table. Opening the presents was a little bit of a fiasco. Unlike previous years where we did a round robin, they tried a strategy of giving everyone a present at the same time. We need to rethink this in the future.